The version "op" prints the estimation which Houdini uses in the search. But it is of internal kind/size in which the estimation of a pawn is equal not 100, but 200. And all other parametres are doubled in comparison with Ivanhoe and other similar cursors. Therefore in the version "p2" the deduced estimation is divided through 2 so that a more natural value of an estimation is turned out. In original Houdini the deduced estimation is a little strange and not having any relation to the reality. It has appeared since yesterday on openchess forum. The purpose was to compare the original evaluation of Houdini. Osipov released it. On this occasion a little joke. These versions have been obtained by a binary hack of the offical Houdini that modifies the output. 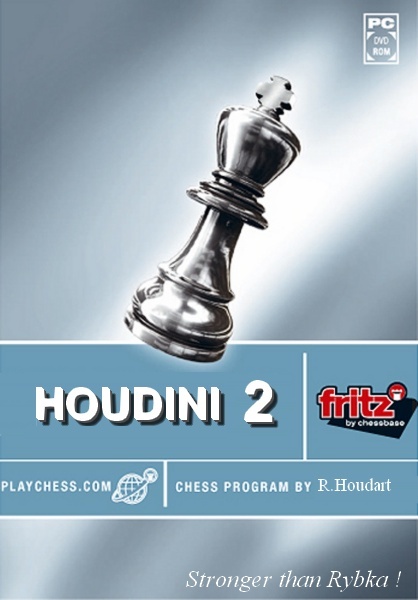 Be aware that the evaluation shown by these hacked Houdini executables will no longer take into account certain elements relating to endgame tablebases, contempt and the stage of the game. Use these versions at your own risk/peril. I understand that would be a great improvement. I played approximately 22 games with new 15a x64 op and won nearly all of them against people i have been drawing with or losing to for years. As a result, played 12, 1 +1 sec blitz matches with the regular 15a x64 houdini and the new one, both with using Vassely 1.0 opening book. Incredibly, the patched engine won 8 of them with 3 being draws. There is definitely something going on with this new engine, try it for yourself. The engine also appears to be stronger playing white for some reason. thanks for you input eduardotav, I went back and carefully studied my tests and found that I had 2 CPUs running on the new engine and only 1 running for the original houdini engine. I think this explains my mistakes. Thanks for pointing out what I should have known. two 64 bits Houdini fixed versions? always gives me a message: Houdini 1.5a already exsist. Marijana: u should go first and delete the houdini 1.5a that u have installed previously; now, try to install it and thats it. as i have said when i rename that version the system refuse to install it and the pc "freeze"
yes, and now it is impossible to remove hiudini from fritz. @Marijana22 wrote: yes, and now it is impossible to remove hiudini from fritz. ok what is p2 version for? i see 2 versions one says op one says p2.. i got op and using it.. what is p2 for? i renamed the engine 1.5a_X instgead of op in my fritz12 and its running the op version just fine.. since there is an 1.5a already i just renamed it _X.. that is ok right?